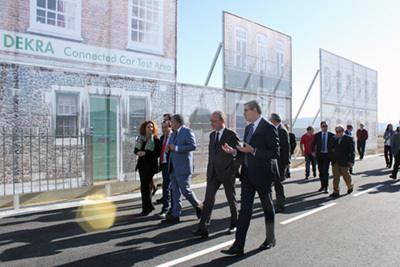 On November 24, international expert organization DEKRA officially opened its connected car test area in Malaga, Spain, as part of its international network for connected, automated, and electric driving. At the opening, DEKRA's experts organized two live connected car demos that showed test scenarios designed for specific V2X technologies. Important connected car functionalities revolve around V2X (or vehicle-to-everything) technologies (e.g. cars, infrastructure, pedestrians). These technologies allow vehicles and other road users to receive the position and movement data of all the other road users and infrastructure in their vicinity. Two live demos illustrated some of the scenarios DEKRA has developed to test V2X technologies. BMW made three conventional and two electric vehicles available for a demo about Emergency Electronic Brake Lights (EEBL) and Road Work Warning (RWW) scenarios. Other technologies that DEKRA will test include left turn assist, blind spot warning, forward collision warning, green light optimal speed advisory, red light violation warning, and control loss warning. All of the test scenarios are already available for customers. The opening of the connected car test area was attended by various government officials and the DEKRA top management. Ivo Rauh, Member of the DEKRA SE Management Board and head of DEKRA's Industrial activities, about the opening: "The Malaga test area, part of our global testing network, will allow us to smartly combine safety and connectivity testing, enabling automotive manufacturers and suppliers to gain a competitive edge. Manufacturers can start future-proofing right now." DEKRA's connected car test area will become a key component of its international testing network for connected, automated, and electric driving. Bert Zoetbrood, CEO of DEKRA's global Product Testing & Certification division: "The hub in Malaga will focus amongst others on R&D validation and early production testing, while the existing DEKRA testing oval and the recently acquired Lausitzring race track in Klettwitz, Germany, will be able to host much larger volume of tests and multiple projects simultaneously." DEKRA has recently obtained the ISO 17025 accreditation for car safety technology eCall, ERA/GLONASS for testing in the lab and at customer premises, WAVE (Wireless Access in Vehicular Environments), and IEEE802.11p. In addition, DEKRA was recognized to provide testing and type approval services for eCall according to regulation EU 2017/79. The new connected car test area can be found at Parque Tecnológico de Andalucía (Andalusia Technology Park) in Malaga, Spain.